Search for property on the move with the Farleys property search app. 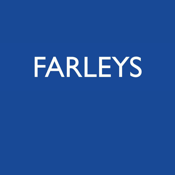 Farleys has been a leading agent in the Royal Borough of Kensington and Chelsea for over 100 years. We are a professional, progressive and proactive company specialising in residential property. Our services include Sales, Property Investment and New Developments, Lettings, Property Management and Refurbishments. Our experienced and enthusiastic team has comprehensive local knowledge and will be able to assist you in making the right decision. Farleys’ unique selling point is the ability to guide clients through all the above services in a timely and successful transaction. Browse our portfolio of Sales and Lettings properties with the ability to tailor the search results to meet your specific needs. Once you find a property you like you can simply contact us directly from the app or save the property to your favourites and contact us at your leisure. Search in your current location - Using the GPS function you can perform a search and see what properties are available in your current location. Valuation Assistant - We offer the following services:Sales and Acquisitions of Houses and Apartments, Experienced negotiators with excellent knowledge of the area, Market Appraisals, Advice on Preparing Properties for Sale, Advertising, Brochure Design, PR and Marketing. We are Members of NAEA and The Property Ombudsman.